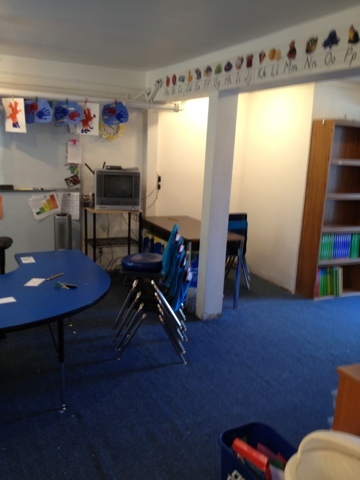 The Lower Elementary Cottage: New Carpet! New Shelves! Funny Kid Writing! 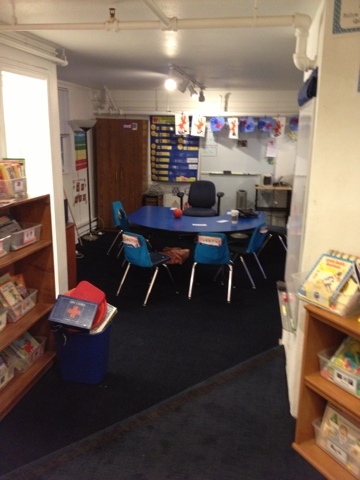 My classroom has had a whole makeover since the school year started!! Today I walked in to BEAUTIFUL new carpet and 2 HUGE new bookshelves!!! Sooo excited! I was at work an hour and a 1/2 before school started to put everything back away in my classroom. It's not quite picture worthy, but trust me... it's wonderful! I'm working away at reorganizing and boy is it looking sooo much better. Clutter was my class this year purely to lack of storage! My cottage is super adorable, but was never a functional space as a classroom. It's finally almost perfect! The only thing I wish for is counter space, but whatever... that's why they created plastic organizer bins! Thank goodness my kids hit that "March Groove" You know the one... that moment you wait for since the first day of school where the kids know the routine so well you never say a word and they just work and do what they need to do. AMAZING! So my plan was to let the kids do Starfall and other learning games on the computer this morning while I finished putting my room together. Then AWESOMENESS happened! The kids pulled out their seat work folder and worked silently while I put things on our *new* shelves. They brought me their papers when they were confused or needed me to reword the directions, and then they kept on working! Note: I told them what I was doing and that my plan is to work while they work, and of course I'm here to help them and will stop ANY time they need help. They worked hard and I had most things back in their place by the 10:00 recess! Whoo hoo! Here is what I walked into! Yes, this is only the shelves and carpet, you DO NOT want to see what my kitchen looked like with EVERY teaching material I own inside of it! Or maybe you do, but I'd prefer to pretend that never happened, so I didn't take a picture! I'll post the finished room this week. I'm undecided about a few shelves, and my label maker ran out of white tape. I tried the gold, which is pretty... but not very readable. That's my stuff in the recycle bin that the construction workers didn't know what to do with. 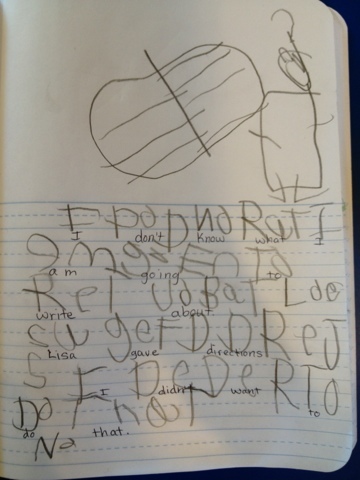 So today a kindergarten kid was stalling on his writing BIG TIME. I finally had enough and said "Just write! Anything! I gave you topics to choose from. Just pick something and write! If you don't write, you drop a level on the color chart for being off task!" I turned around and he got right to work. When he was done, I cracked up laughing!! In case my writing is chicken scratch, it says: "I don't know what I am going to write about. Lisa gave directions but I didn't want to do that. No." And the picture is of him with a question mark over his head and his writing book in his hand. Too funny! 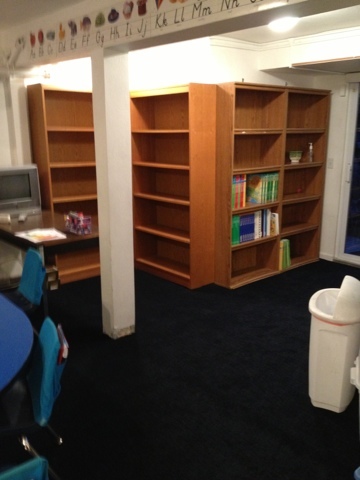 Congratulations on the new carpet and bookshelves - I am SO happy for you...and JEALOUS! :) I long for extra bookshelves/filing cabinets!